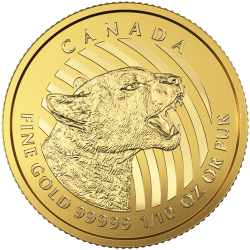 The Call of the Wild Gold Coin Collection from the Royal Canadian Mint was launched in 2014 with the Howling Wolf. These exclusive gold coins are inspired by the iconic wildlife that inhabits the Canadian wilderness and subsequent issues include the Growling Cougar, the Roaring Grizzly and the Bugling Elk. The 1 ounce gold coins have a millesimal fineness of 999.99 making them the world’s purest bullion coin and they’re also the world’s highest value legal tender 1oz bullion coins with a face value of $200 CAN. All Call of the Wild Gold Coins feature the Mint’s intricately micro-engraved textured maple leaf security feature. Buy Call of the Wild Series gold coins VAT Free with coininvest.com.